Based on research conducted by Carlos Gantz, Brian Stanton, Rich Shuren, Jesus Espinoza, and Luke Murphy of GreenWood Resources, Inc. Researchers have demonstrated that it’s possible to breed better poplars for bioenergy, and GreenWood Resources Inc. (GWR) is continually working to do just that. The environment, such as soil conditions and water availability, impacts a poplar farm’s productivity, but so does the genetic make-up of the trees. The question is how much do genetics matter? To what extent can we influence the expression of traits favorable to biomass yield and conversion efficiency? Understanding the genetics of a plant can vastly improve our ability to predict what we’re going to grow and move us toward more desirable products. Think how selective breeding has stocked our grocery shelves with seedless grapes and watermelons, over 100 varieties of apples, and large ears of corn. You may not see poplars at the grocery store, but GWR scientists are using their understanding of genetics to determine the best poplar trees for bioenergy. GreenWood Resources planted multiple varieties of hybrid poplar at the demonstration farms. Note the differences in leaf color in this aerial picture of the Jefferson site. Most of the poplar trees planted at AHB’s four demonstrations sites are “tried-and-true” traditional industry varieties, but these varieties weren’t bred with bioenergy in mind. To create varieties of hybrid poplar optimized for producing biomass for fuel, GWR established trial plots at the sites as part of a breeding program. The characteristics expressed by an individual tree (its phenotype) are influenced by its genetic make-up (genotype) and its environment. Within a given vegetatively-propagated variety, all of its member trees share the same genetic make-up (they’re clones). That means differences observed between trees of the same variety are solely a result of the environment. A breeding program needs a degree of genetic control in order to create better varieties. Genetic control is scored as a range of repeatability between 0 and 1. The greater the control that a tree’s genes exert on the expression of a trait relative to the influence of the environment, the closer the repeatability score will be to 1, and trees of the same variety will increasingly resemble one another. Results for the Jefferson trial are presented in Table 1. Table 1. 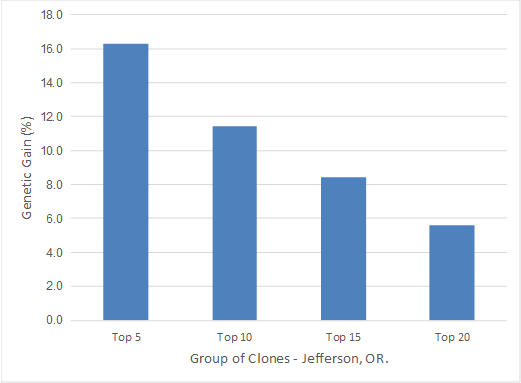 Predicted clonal repeatability for poplar traits for the Jefferson, Oregon site. These traits show varying levels of genetic control. Notably, biomass production (DMT per hectare) has a decent repeatability score. Therefore, good genetic gains can be obtained selecting the best trial varieties (Figure 1), producing poplar varieties that can generate more biomass for a bioenergy industry. Figure 1. 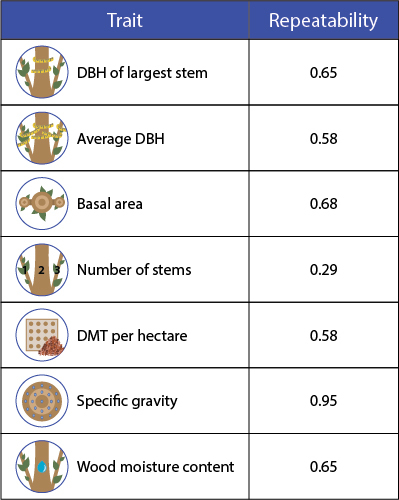 Genetic gains over the best performing variety in the AHB biomass plantations, obtained by selecting groups of varieties in the screening trial at Jefferson, OR. Selection of the top five test varieties can increase biomass production by 16% compared to the highest performing traditional varieties. Selecting larger groups of test varieties decreases genetic gains, but retaining more genetic diversity may be prudent for providing protection from unforeseen challenges, like unusual weather conditions or disease outbreak. Even if selecting the top 15 varieties, an important increase (13%) can be obtained. 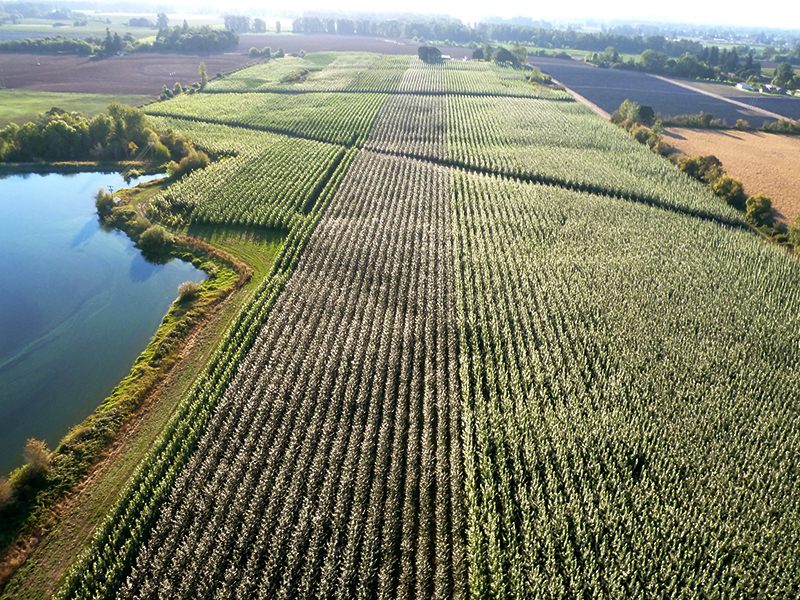 These results show the importance of researching genetic selection, in addition to environmental conditions, to increase biomass and bioenergy production. In addition to studying hybrid poplar varieties for AHB, GWR is working with the BioEnergy Science Center (BESC), led by Oak Ridge National Laboratory, to test molecular tools for selecting the best parent poplar varieties for bioenergy production. These parent poplars [e.g., varieties of black cottonwood (Populus trichocarpa) and Japanese poplar (P. maximowiczii)] can then be crossed to produce better hybrid poplars. In 2009, GWR field trials contributed to BESC’s Genome-Wide Association Study (GWAS) of nearly 900 Populus genotypes. In 2013, GWR established a new P. trichocarpa trial to evaluate 317 varieties using genome-wide selection (a technique which uses molecular data to predict phenotypic performance). This study will identify the best varieties for future poplar hybridization.